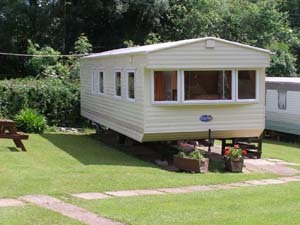 Caravan has two bedrooms, one double and one twin with double being en suite to shower room. Kitchen with four burner gas hob and oven, lounge with electric fire and dining area. Kings Orchard Park is a delightfully secluded, and tranquil family run site.It is located in the Wye Valley, S.Wales an area designated as of "outstanding natural beauty", one mile from the centre of the historic market town of Monmouth. The Royal Forest of Dean, Symonds Yat, and the charming town of Ross-on-Wye are "on the doorstop", with the Brecon beacons and Welsh Valleys but a short drive away. For further details, pictures of the park and larger picture of the caravan for sale please visit our websitew at www,kingsorchardpark.co,uk where you will also find details of how to find us together with telephone and email information.